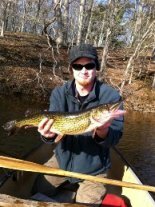 CTFishTalk.com: Snakehead in ct - Connecticut Conservation & DEP ( CT Conservation & DEP ) - A Community Built for Connecticut Fisherman. I was wondering if anyone out there know of someone or has heard of someone catching any snake head in ct the last report I heard where from maryland and that was last year just wondering if they moved closer this way or not? Probably not. I think with all the yrs they were available in the aquarium trade it would have happened already.People are always releasing fish that get 2 big. I doubt they would survive the winters up here but you never know. There was a big pacu caught out of a local pond about 10 or more yrs ago that had been released by a customer of mine @ the time. He thought it was funny. The people who caught it and the bait shop they brought it to thought it was a piranha . Not too funny after all. It was in the paper. Dont buy fish you cant accommodate. They do grow bigger than their tanks. See you on the river tonight. I was in dicks sporting goods picking up some more stuff and there was a guy in there also getting some things and he said his friend caught one in the scantic river off the bridge in powder hollow in Enfield.